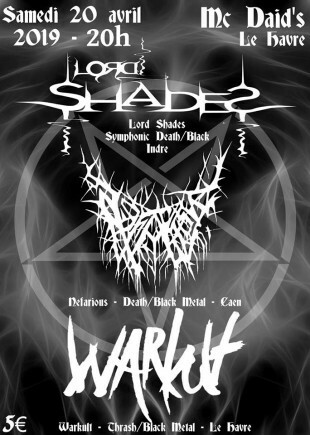 Lord Shades are a band from France that plays a very atmospheric and symphonic mixture of black and death metal and this is a review of their 2017 album "The Uprising Of Namwell" which will be released in December by Doweet Agency. The sounds of people talking start off the album along with some classical guitars a few seconds later before going into a heavier direction along with a great amount of melodic riffing while the solos and leads are also done in a very melodic fashion and after awhile death metal growls are added onto the recording. Black metal screams are also a very huge part of the recording while all of the musical instruments on the recording have a very powerful sound to them along with the music mixing in the symphonic elements in with the heavier sections of the songs as well as some tracks also bringing in fantasy orientated samples. A great portion of the tracks are very long and epic in length while tribal and shamanistic style percussion can also be heard briefly along with a later track also introducing whispered vocals onto the recording and one track also brings in a brief use of operatic female vocals as well as some male ritualistic chants and clean vocals and when the music finally speeds up a decent amount of blast beats can be heard and some tracks also add in elements of ethnic and world music. Lord Shades plays a musical style that is mostly rooted in blackened death metal while also mixing in some symphonic and atmospheric elements to create a sound of their on, the production sounds very professional while the lyrics cover Fantasy themes.